As the Autumn wears on and the berries are over, some of the most exciting foraging is to be accessed with a trowel, notably horseradish, wild parsnip and dandelion. Dandelions are easy to find, you may not even have to go further than your garden, and at this time of year, the roots are at their fattest. You will need to dig them up as they can plunge downwards some 30cm below the surface. The most popular use for dandelion roots is to make dandelion coffee. It has a good, nutty taste, very much like coffee but without the caffeine, so makes a good coffee substitute. To make dandelion coffee, clean the roots thoroughly and chop them into short lengths of about a centimetre. Place them on a baking tray and dry in the oven for about 30 minutes on a low heat of about 50 centigrade; then roast them for a further 20-30 minutes or so at about 150 centigrade. Keep checking during the roasting process and take them out when they are crisp and browned through without burning. The roasted root pieces can then be ground in a coffee grinder and used as normal coffee grounds. 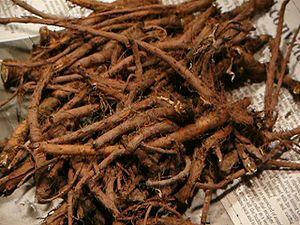 Dandelion roots can also be treated like a root vegetable, something like a “very poor man’s parsnip”. 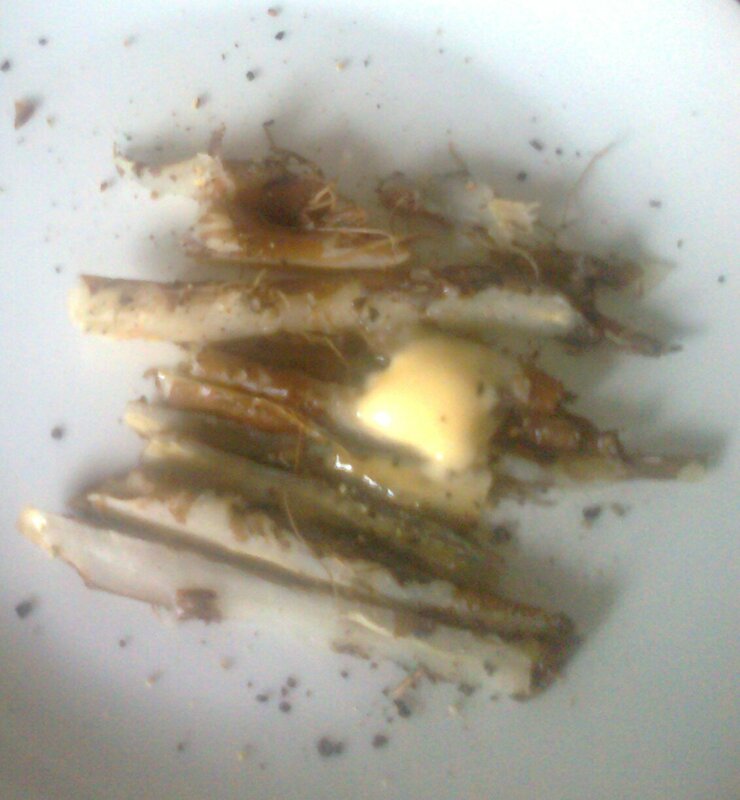 The flavour is quite bitter but also has something of the artichoke about it. Dandelion roots are not to everyone’s taste, due to the bitterness but the best of them can be brought out by careful preparation. Clean and scrub the roots but do not peel them. They will cook quite quickly if roasted under the grill for about 5 minutes with a little olive oil. They can also be gently boiled for about 5 minutes until tender. Serve with melted butter and pepper as a delicate side dish. After they have been coocked the roots are very easy to peel and would make a good addition to a root vegetable mash with sweet potatoes or turnip. 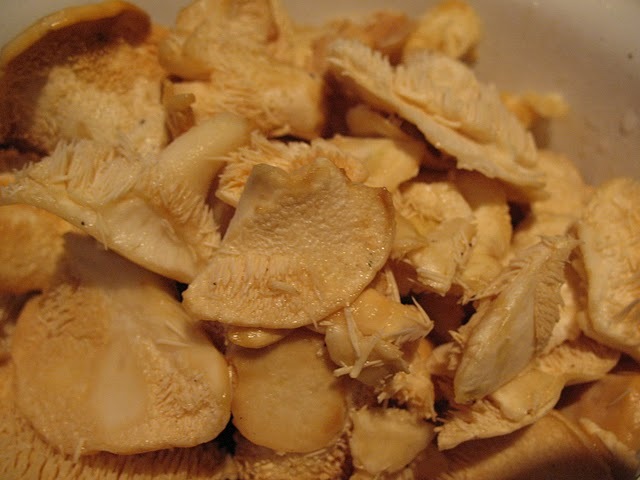 The texture of the hedgehog fungus (Hydnum repandum) is a lot like chicken and it keeps its “meatiness” very well when cooked. It is a wonderful mushroom and it is one of the highlights of the Autumn for me to go and pick these from my secret location. The fruit bodies grow as big as your hand and could just about pass for a chicken breast in your cooking pot. The hedgehog fungus is very distinctive because the spores are secreted by “spikes” rather than gills – hence the name. It belongs to an odd squad of toothed fungi called Hydnaceae that also includes a few other edible species. 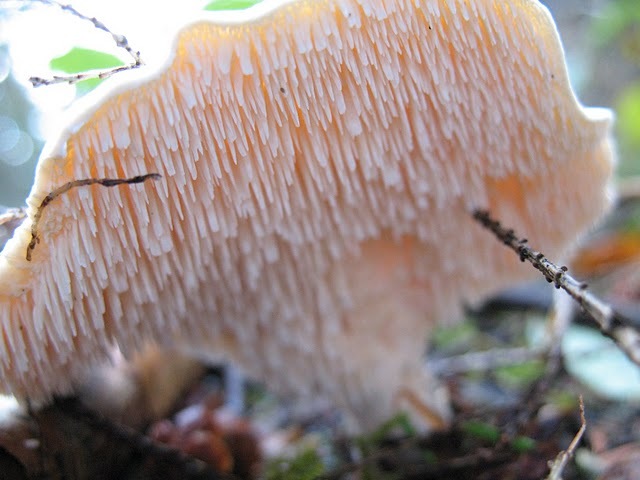 The caps can be pure white to slightly pink or gently orange, depending on where it is growing. They tend to take on the flavour of the leaf litter in which they grow, too, so I am accustomed to finding them slightly bitter and piney – but delicious. As far as guidance on where to find them goes, I can’t offer a secret formula. I have tended to find them in established pine forest and in damper conditions. Try to see where water is seeping down a slope. If you find them in one place, look directly up and down hill for more because the spores will be water borne. Where they do grow they should be quite prolific and will reliably return year after year, the caps getting anually bigger as the fungus gets established. I have picked them in the same place for ten years now. A bit like chicken, really. Be sure not to uproot the fungus when picking it, but cut away the the caps leaving the stems in the ground to improve the chances of the mushroom continuing to flourish. Please also read my general advice about Picking and Identifying Edible Mushrooms and remember to be 100% certain of your identification with all mushrooms – use a good photographic field guide. These mushrooms dry very well and are reputed to store well; but they always get eaten pretty quickly in my house. 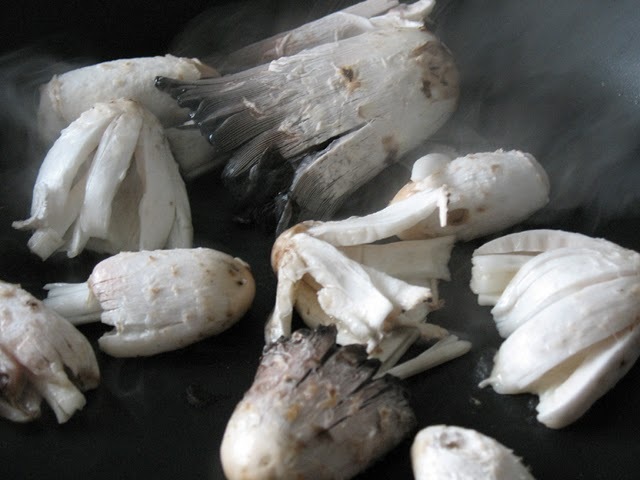 Shaggy Ink Caps (Coprinus comatus) are a wonderfully “mushroomy” mushroom in both taste and appearance but you need to pick and cook them quickly before they collapse into an inky mush of spores. 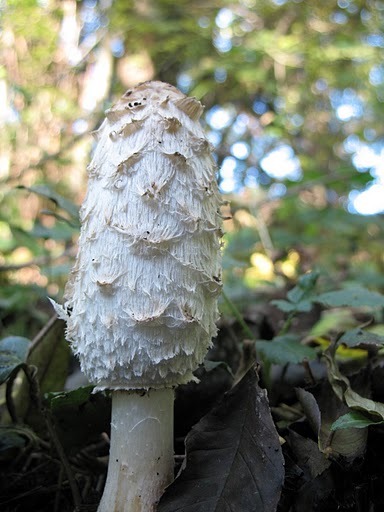 The distinctive appearance of this mushroom has earned it the common names “Lawyer’s Wig” and “Shaggy Mane”, both of which are apt descriptions. What can be offputting about them is that as they mature, the margins begin to break down and dissolve into a black liquid that contains the spores – that’s where the “ink” bit comes from. 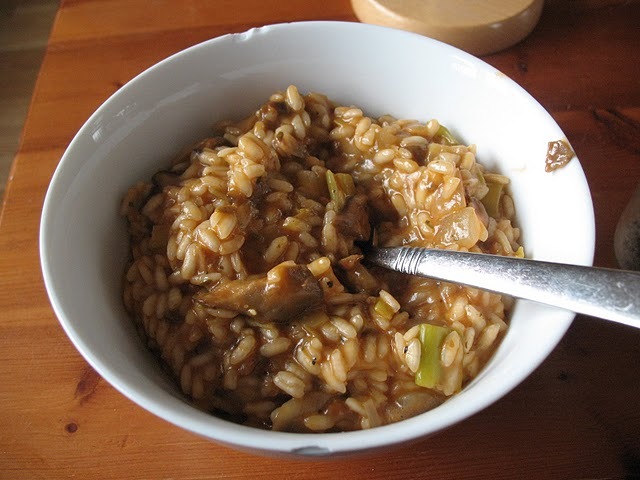 In fact, the whole mushroom disappears into a self digesting black mush within a few hours – nice. Thankfully, shaggy ink caps are quite common and have turned many a futile foraging expedition into rich pickings for me. Keep an eye open for these beauties, particularly on roadsides and on waste ground as well as under pines. They have been around for several weeks already and will continue to appear late into autumn. When picking them go for the younger specimens as always although if you intend to cook and eat them within a couple of hours, a little bit of raggedness around the edges won’t hurt; i.e. if the caps have started “inking”, you will still be able to eat them. In the pan, where they belong! These mushrooms have a lovely flavour and I enjoy them enormously, fried with onions or liquidised in a soup. Be aware that although they are a pretty distinctive species there are a number of “inking” mushrooms some of whom it is not advisable to eat at all. In particular, the much darker Coprinus picaceus can resemble young ink caps. Use a couple of field guides to confirm your identification, preferably consult a friend who nows what to look for, don’t eat anything you are not 100% sure of, cut the mushrooms at the stem rather than pulling them up … blah, blah … please read my more detailed article on Picking and Identifying Edible Mushrooms for some general advice on foraging. These beautiful little mushrooms must be called “deceivers” because their bright purpleness probably screams “poisonous” or at least ” hallucinogenic” but, of course, they are neither. In fact, they are tasty and delightful, raw or cooked. Start looking for these now in the leaf mould at the base of beech trees and chestnuts, but also keep an eye open for them in coniferous woodland. The very distinctive purple colour is instantly recognisable but not as easy to spot among fallen leaves. Where they do grow they are likely to be fairly abundant (growing in troops) and recurrent throughout the season; but I have rarely had luck with them in the same place for more than a year. The Amethyst Deceiver is a small mushroom, the largest specimens being up to 2 inches accross. As they get older, they will become paler and it is best, as with all mushrooms, to try and go for younger and firmer examples for cooking. These mushrooms also need to be well cleaned before they are cooked as a lot of matter can get caught in their broad gills. A very similar close cousin of the Amethyst Deceiver is also tasty and useful and called simply “The Deceiver”. It has all the characteristics of its lilac relative but is a red-brown colour. 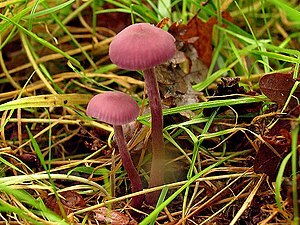 I recommend becoming familiar with the Amethyst Deceiver before adding the Deceiver to your foraging repertoire because the latter has more deceptive look-alikes. Before heading out to pick mushrooms please remember the GOLDEN RULE of only eating what you are 100% sure of identifying correctly. You will need at least one very good illustrated mushroom guide to do this and preferably someone who knows what they are doing to supervise. 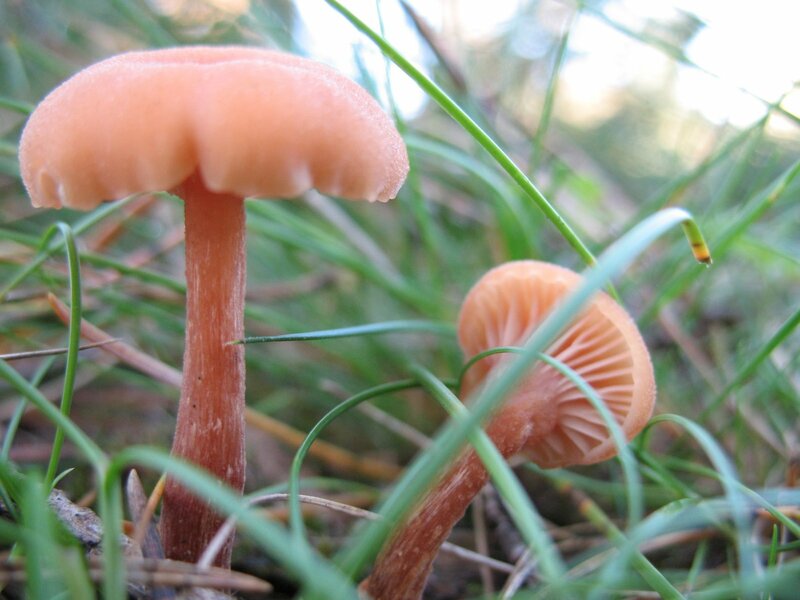 Please read my last Foraging Friday post on Saffron Milk Caps for more advice or consult my article on Picking and Identifying Edible Mushrooms for some good guidelines. I won’t be held liable for any reader who poisons themselves. Having said that, please enjoy wild mushrooms responsibly and I would encourage anyone to step out into the woods this weekend and discover what nature has to offer. 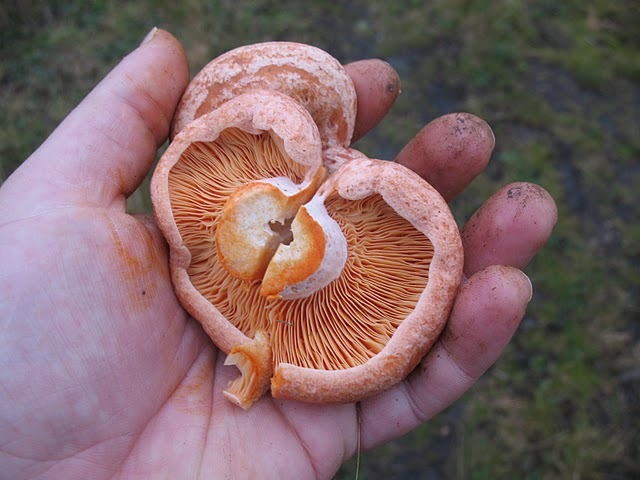 Wet and horrible today but I am hoping this weather will bring out the mushrooms and I’ll be able to visit a favourite spot for collecting saffron milk caps (Lactarius deliciosus). I love showing people these mushrooms and then declaring that they are not only edible but delicious. The way that they bleed bright orange is quite offputting for some and most people would instinctively think that this indicates that they are poisonous. Preferably go out with someone who knows what they are looking for who can show you the mushrooms in the field and talk you through or show you the inedible or poisonous look-alikes. Invest in at least two books. Get one photographic field guide to carry with you and keep at home a large and thorough mycology book that will go into much greater detail. It is not likely that a field guide will show you everything you can find and you will need another book to double check identification. A photographic guide is very useful but you cannot depend only on outward appearances. If in doubt about a specimen, take a few home and analyse them. Get a spore print at least and look it over very carefully before comitting to an identification, or show it to a friend who is more experienced. Thankfully saffron milk caps are very distinctive and you can be pretty sure of them. The features to check for are the carroty orange colour and the concentric ring-like effect on the top of the cap. The cap margins are slightly rolled in. When fresh and cut they will bleed an orange milk and when bruised, the flesh and gills will turn blue. The gills are decurrent, which means they extend down the stem. 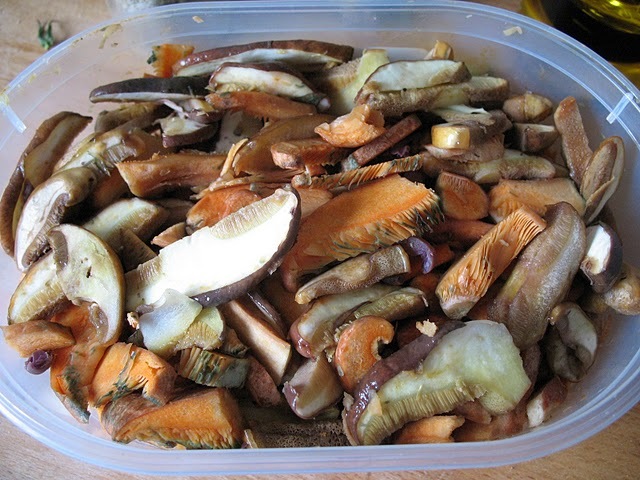 Many people can also detect a slightly fruity, apricot smell to these mushrooms. Look for them in pine woods where they will return frequently and you will be able to find them consistently from September onwards until late November. 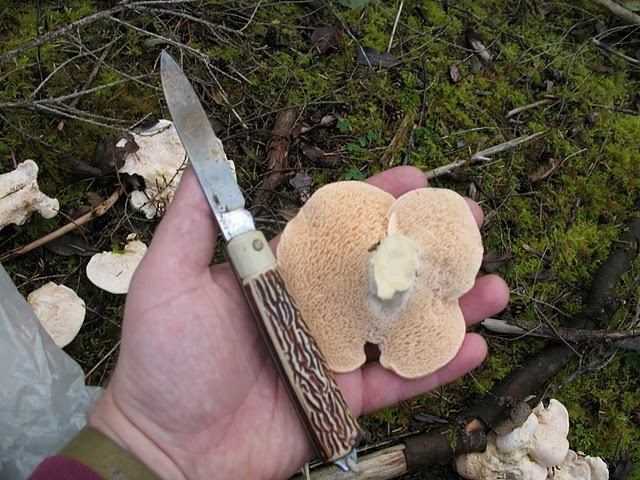 When picking mushrooms, use a knife to pare them off at the bottom of the stem, leaving the root in the ground as pulling them up will destroy the mushroom and spoil its chances of fruiting again. Remember most of a mushroom consists of tiny threads under the ground and what you are picking to eat is just the fruiting body. With saffron milk caps you need to be out early before the critters get to them because they are loved by grubs, too. It is worth cutting the body in half when picking so you can see if there is any infestation that will show up as dark blue speckles and tunnels in the flesh. As the fruit bodies mature they will go pale and can get quite large but older specimens are certain to be full of grubs and virtually tasteless. You need young and firm specimens. Not all milk caps are edible and be sure that you are not picking brown roll rims (Paxillus involutus) which look similar and also bleed although tending to be brown, or woolly milk caps (Lactarius torminosus) that are pink or red and have a woolly margin. Use identification guides and be sure. These mushrooms keep their texture well when cooked and I just like to fry them with a bit of garlic infused olive oil, add them to a risotto or a mushroom salad. Disclaimer: the author will not be held liable for any ill effects resulting from misidentification of mushrooms based on this post. Please take responsibility to get a positive and accurate identification before eating any wild picked mushrooms. The unsung treasure of our beech forests in late summer, Beech Nuts (or “mast”) have never really made it as a popular nut for foragers. People are put off by the fiddly smallness of the nuts and the chore of peeling them, as well as the unreliability of the harvest. In some years the nuts are fat and worthwhile, but there are also years when the shells are empty. Beech trees, it seems, go through a three or four year cycle, culminating in bumper crops, but with a lot of disappointment in between. The nuts have a high yield of oil when pressed and this has been their main use in years gone by, however, as a wayside snack or to add interest and body to a salad it will only take a couple of minutes to gather enough. My preference is to take them home and shell them and gently roast in the oven. The taste is much like a filbert with a little of the bitterness of an acorn. 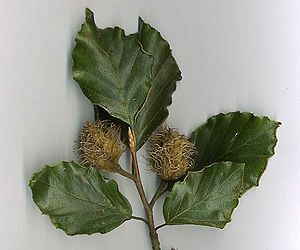 Beech mast can be gathered in late summer, early autumn and have been falling for a couple of weeks already in my locality. Look on the ground for little shiny brown nuts about 1.5cm long with a triangular cross section. In a good year you will be competing with the squirrels for these but don’t go overboard, they probably need them more than you for the winter. Rosehips were considered such a good source of vitamin C that, during the lean war years, school children were sent out to pick them. Preparing them takes a little bit of effort as the microscopic hairs that the same school children would use as “itching powder” need to be extracted from the fruit bodies. However, the effort is well worthwhile for rosehip wine, rosehip jelly or rosehip syrup that can be drunk as a cordial or poured on ice cream. Where to find them: In the UK the wild rose or “Dog Rose” populates hedgerows but tends to be rarer on the coast. It is a fast growing and very hardy plant and in my experience it is often found on hard or waste ground where less competitive species can’t establish so well. Varieties of garden escapees make it in the wild, too. Picking: Go for the reddest fruits and avoid discoloured, mottled brown or green ones that have probably been invaded by parasites or have not matured. The fruits pop off the stem quite easily at the base and can even be picked late into November after the frosts when they are starting to go slightly wrinkly provided there are no critters in residence. Preparation: I never have the patience to brew things so I make a simple syrup/cordial that can also be turned into a jelly if desired. Pick through the fruits, top and tail them and discard any that are too infested. You’ll need a bit of muslin and a couple of saucepans (I use a linen tea towel but if you do, then don’t expect it to ever be the same, it will get stained). Slice the hips up fine or pulp them in a food processor. Add a pound of hips to about 4 pints of boiling water and simmer on low heat for about 10 minutes. Strain the pulp through the cloth and keep the liquid. Bring another pint of water to the boil and simmer the pulp a second time for 10 minutes or so. Strain again and repeat one more time. Compost the pulp (yeah!) and put the liquid on to boil and reduce, adding about a pound of sugar. Keep reducing until you have the desired viscosity – i.e. thick and gloopy for a syrup and more runny for a cordial.